Outside a non-descript building on a West Los Angeles side street sat a few yards of red carpet unfurled from the doorway to the edge of the sidewalk. Not exactly a typical Thursday sight in front of the otherwise anonymous exterior of Village Studios, a top flight recording house, but certainly appropriate as a welcome to Sirius XM radio’s Town Hall series and the evening’s guest Ziggy Marley. 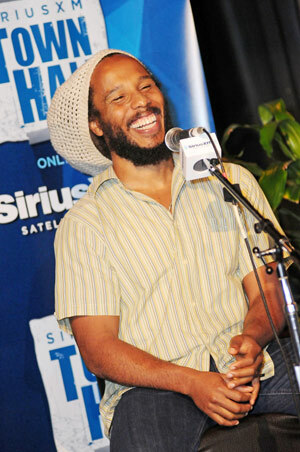 Marley, dressed in striped short sleeves and jeans with a beige knitted tam covering his dreadlocks, was an early arrival, smiling and relaxed before taking the stage in front of two dozen contest winners and their companions. As part of the live interview session Marley was joined by host Pat McKay who directed the audience members to ask their pre-selected questions, while interjecting some of her own. Covering several topics including the Grammy-winning reggae star’s affinity for growing tomatoes and beans, the subject of many an inquiry was Marley’s relationship with his father Bob. Often repeating the question to himself, Marley offered thoughtful responses and seemed at ease with the intimate format. Interspersed with the Q&A were three solo performances. 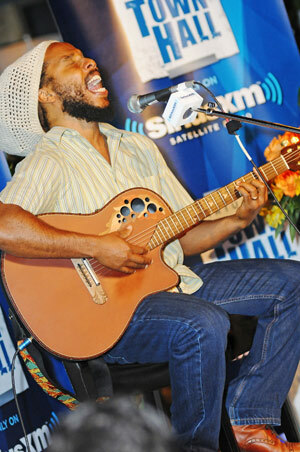 Strumming his Ovation acoustic/electric, Marley gave impassioned renditions of Personal Revolution from his recent Wild and Free album, as well as live staple Dragonfly and the title track from 2006’s Love is My Religion, altering the lyrics slightly on the latter with a nod to the Beatles’ All You Need is Love. The 90-minute broadcast was filled with personal anecdotes and showed Marley to be quite introspective in light of the recent Marley documentary and its release on DVD. Laced with humor and self-deprecation, the celebrated musician was generous and playful with his opinions, apparently enjoying the immediacy of the setting. Overall, a special treat for those in attendance and those listening on radio. To be a good human being in service to other human beings. Keep a positive outlook and keep spreading love. They were dressed as we were taught to see women…, as the queens that they were. Music will always be a catalyst for change, but it can be a change for something good or not so good. We’re a team. He is the Captain. I’m a mid-fielder.